Commercial trucks are not only difficult to maneuver, but at top speeds, it could be close to impossible to make a big rig come to an immediate stop. Due to the reduced ability to react quickly, many fatigued big rig motorists will be faced with having to make split-second decisions on the road. These split-second decisions can be life-threatening. According to research conducted by the National Transportation Safety Board, big rig motorists may contribute up to 40 percent of all commercial truck roadway accidents. Clearly, a fatigued motorist is not able to think clearly when on the road. Fatigue can result from inadequate sleep, being on the road for far too long or driving way too many miles. Often, the pressure from having to make deliveries on time causes drivers to stay awake for an unhealthy amount of hours. It is important to recognize that even losing a few hours of sleep can lead to driver fatigue. If you or someone you know has suffered injuries due to the negligence of a truck driver, seek the legal advice of an attorney who can help you file a claim against the driver. This article will cover an overview of driver responsibilities, as well as when a trucking company can be held liable for truck accidents. The Federal Motor Carrier Safety Administration has established regulations that require big rig drivers to take breaks for resting. The administration has set forth that big rig motorists only drive for a max of 11 consecutive hours after having taken 10 hours consecutively off. It is against the rules for truck drivers to drive past the 14th hour once they have been on duty. Furthermore, truck drivers cannot drive over 60 hours in a given week, nor can they drive over 70 hours in 8 days. Regrettably, many big rig drivers do not abide by the rest break system. One method that was set forth to combat this, however, was the use of log books. Big rig motorists are required to provide a log book which contains their period of service for every 24 hours. The trucking companies that employ these drivers also have the responsibility to ensure that these drivers are in fact maintaining their log book. Based on the deliveries that these truck drivers make, truck companies are able to distinguish between a falsified log book and a legitimate one. Log books have become an essential piece of evidence that could incriminate or discharge a truck driver for illicit activity that he or she may have been accused of. This includes cases of personal injury in which a truck driver is being accused of driving negligently. In these types of cases, a lawsuit could be brought forth against the driver as well as the trucking company that employed the driver. Due to the sheer size of a big rig truck, one single accident can cause catastrophic damage. This includes paralyzing injuries and death. The surviving loved ones of the perished victim(s) may be able to file a lawsuit against the driver for his or her negligence. Unfortunately, the driver may not have the sufficient amount of insurance to cover all of the victims or their injuries. For this reason, many victims choose to file a lawsuit against the trucking company that employed these drivers. Based on vicarious liability, a trucking company can be held responsible for not ensuring that the truck driver took the necessary rest breaks or that he or she falsified the log books. This form of liability will be derived from negligent supervision. Truck driving companies will only be held liable for drivers they have actually hired. Unfortunately, many companies have now begun to employ big rig drivers as independent contractors. This has allowed the companies to remain separate from the drivers. If you or someone you know has suffered an injury because of the negligence of a big rig driver, obtain the legal support of a skilled attorney. An attorney with the right experience can help you, even if the big rig driver caused major damage and is employed as an independent contractor. Based on the specifics of your case, an experienced truck accident lawyer can still go against the trucking company in order to win your case. 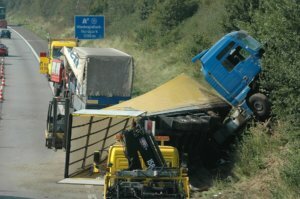 Trucking accidents are very dangerous and can easily cost lives or permanent injuries to many. If you survived a trucking accident, it is likely that your medical costs will be extensive, and the damage could be permanent. High medical bills, the inability to return to work, prescription medication and even stress can be your life after a truck accident. Consult the advice and support of a skilled truck accident attorney who has the right experience to champion on your behalf. With the right attorney, you can obtain the compensation that you are owed and create a stable foundation for your life going forward.